I like stuff. There, I said it. I like the idea of having a full closet. Full desk. Full make-up bag. Extra shoes, even underwear, just in case. I like to think that if it all vanished at once, I'd be just fine. That it's the picking-and-choosing of what's got to go that is so much harder. Because, what if, I decide to finally wear that Pistol-Packing-Pink nail polish, or I all of sudden fit into my old black pants. Even though I'm a full-time volunteer, whenever it's possible, I like having a good balance in my bank account. I like to pay off my credit card. I like to know that I have money to buy things I need, and â gasp - things I want. I like having a well-stocked fridge. And pantry. And don't forget the Christian liquid of choice: coffee. I like to be in fresh supply. I like to know I have stuff at my finger tips. But that stuff will never save me. It could all disappear in one day. And then what? I felt challenged to look at the way I value the things, or "stuff", in my life after hearing a keynote address by well-known Australian economist Ian Harper. He spoke at the Brisbane Lord Mayor's Prayer Breakfast in May on the topic of Faith in the Modern Marketplace. I attended this early morning event with some 300 pastors, ministry workers and politicians. As an economist, Harper spoke a lot about the Global Financial Crisis, which saw economies around the world slip into disarray. It wasn't simply the ethereal economies that suffered, real people suffered. One day they had a home. The next they could no longer afford it. One day their bank accounts or stock portfolios made their retirement look pretty cushy. The next, what retirement!?! Well, Harper's main argument, one he says he learned during his career, was that we cannot turn to the marketplace â or my stuff as I'll call it - as a source of spiritual wellbeing. Of course, in-and-of-themselves economies, finances or stuff are not an issue. The amount of personal satisfaction or comfort I gain from having it all is an issue however, one that God takes very seriously. Anything that gets ahead of God in my heart is an idol. In his keynote address, Harper revealed that he too was faced with an ugly reality: he'd allowed his work with money to become his religion. He said the market that was serving him in his job was, "demanding too much sacrifice. The market becomes an ever demanding task master. Once on this ride, it is difficult to get off, as it goes faster and faster." Earlier, I admitted that if I was to lose all my stuff one day, I think I'd be just fine. And I do really believe I'm at a place in my faith that it would be true. I liken it to a mathematical equation that's made the rounds in Christian circles over the last couple years: Jesus + nothing = everything. I've even seen a pastor wearing it on a t-shirt while speaking from the pulpit. I'm not quite sure when or how it happened, but even though I like to have stuff, my grip on it all is quite lose. This, however, wasn't the case when I first became a Christian in my late 20s. I was in a high-paying career, had grown up in a wealthy town and wanted to show off. It was as though the more things I could purchase the better I felt about myself. Harper, the economist, spoke of this psychological/economical theory dubbed "conspicuous consumption." In it, he said people think purchasing things and the appearance of wealth will satisfy them. But as Harper put it, "they are bound for disappointment. In the end if everyone has one, then whatever "it" is has lost its worth and thereby your own." It's true, a lot of my worth before I became a Christian was found in the things I could accumulate, and how it made me look to other people. Did my stuff have the right style? Or the looks of someone who never wore the same outfit twice? Or could pull out the fanciest foods for a quick snack with friends? Jesus, however, puts it this way, "What good is it for someone to gain the whole world, but forfeit their soul?" (Mark 8:36 NIV) When I reflect on it now, the stuff I had didn't actually satisfy me. I was full to the brim with stuff, but empty inside. Harper's conclusion for his own life and his suggestion to others is, "The market is good, but it is not God. It is to be respected but not worshiped." My stuff, oh all that pretty stuff, cannot be my saviour. The clothes will wear out. The pantry contents will eventually rot. My bank account will fluctuate. These things do satisfy my earthly needs â but Jesus my true Saviour â offers so much more. Lisa Goetze grew up near Toronto, Canada, where she worked as a writer for two national news broadcasts. 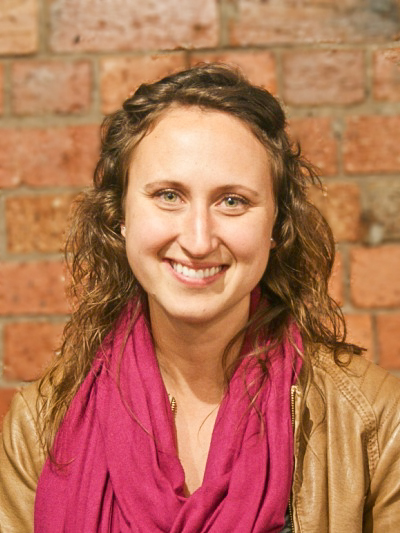 She now serves full-time at Youth With A Mission in Brisbane.